Napa. 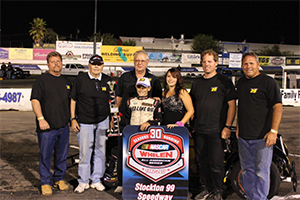 California ( September 4, 2011) – 13 Year old Legends of the Pacific Rookie, James Bickford, scored his first Legend main event win last Saturday night at Stockton 99 Speedway. Starting 7th, his popular win came after several exciting laps of battling side by side with Legend regulars Jessica Walker and Tony Mangini. "James was very patient and used his experience to get by the competitive field of cars" commented his dad, Tom Bickford. James has an impressive resume with winning 15 Quarter Midget Championships and over 200 main event wins in his young career. Last year, he raced in the Bandolero class and won 6 Main events in just 14 starts and won Rookie of the Year at Ukiah Speedway. This year James has already clinched the Semi-Pro Legends Championship with his win Saturday night. James has also secured the Rookie of the Year for Legends of the Pacific with a commanding 41 point lead with only three races left in the season. In addition, he set the track record of 15.232 at All American Speedway in Roseville, Ca. last May in only his third try at the track. James has qualified fast time at three events and has qualified in the top 5 in all of his races this season. James has posted 10 top 6 six finishes in his first 16 starts. He has also scored several heat wins along with a trophy dash victory. James Bickford Motorsports graciously thanks sponsors Red Line Oil. Learn more about James Bickford at www.jamesbickfordmotorsports.com or by visiting him on Facebook at keywords "James Bickford Motorsports".